Australian sandalwood Santalum spicatum is a woody perennial which is distributed across the arid and semi-arid regions of Western Australia and South Australia. Like all members of the genus S. spicatum is an obligate hemiparasite, meaning it requires a host tree to survive during its earlier years. This characteristic, combined with the species' slow growth, makes cultivation a difficult, long-term investment. Many challenges face the species throughout its lengthy lifespan. Its large seeds are thought to be primarily dispersed by the critically endangered brushtailed bettong Bettongia penicillata ogilbyi, which have been all but wiped from mainland Australia. Furthermore, the high palatability of the plants results in vulnerability to grazing pressure. Such factors may have contributed to the 'endangered' conservation status of the species in South Australia. This is one of the most sought-after sandalwood species, second only to Indian sandalwood S. album. They are prized for the aromatic oil contained within their timber, which is frequently incorporated into fragrances, incense and even pharmaceutical products. The high demand for sandalwood oil in both China and India initially supported the Western Australian sandalwood industry in 1844. The industry has flourished into the present, with plantations of both species in Western Australia now supporting the 2500 tonnes of natural S. spicatum stands harvested annually throughout the state. Due to lower densities, the sandalwood industry in South Australia was only active from the early 1900s to post-war 1940s. It is likely that such events may have impacted on the structure and genetic diversity of these populations. Overharvesting can create a bottleneck within populations, reducing genetic diversity and therefore their ability to respond to environmental change. Unfortunately, wild populations of Australian sandalwood are quickly becoming a major target for unlawful trade and over-harvesting. It is particularly problematic within Western Australian and Nullarbor regions where the species serves as a form of income and cultural significance for Indigenous Australian communities. In order to combat this issue, we have developed and verified the ability of a DNA-marker set to determine the geographic origin of S. spicatum. These markers were further implemented to investigate the population genetics of the species across its range. Used in conjunction with field observations and bioclimatic projections, this information helped to identify potential threats to the future of the species within South Australia. 60 single nucleotide polymorphism (SNP) markers were able to clearly distinguish between individuals from Western Australia, the Nullarbor and the remainder of South Australia. 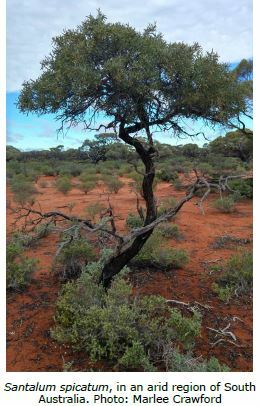 Strong genetic structuring identified within the Western Australian and Nullarbor populations indicated the potential for higher resolution between regions. Further sampling of populations within these areas may therefore, enhance the ability of the SNP marker set to be used for the purpose of timber tracking. In contrast, populations in South Australia (excluding the Nullarbor) demonstrated significantly lower genetic diversity, yet higher levels of gene flow, compared to their Western Australian counterparts. Surprisingly, the final bioclimatic model projections demonstrated an expansion of suitable habitat for the species in South Australia with higher carbon emmision scenarios... The incorporation of demographic parameters (particularly dispersal) may improve the model's accuracy due to their known impact on the population health and stability of S. spicatum. Field observations found aging populations throughout the eastern distribution of the species, with little or no recruitment. There could be several reasons for this, including the lack of a suitable dispersal vector. A further explanation is heavy grazing of surveyed areas by feral goats, sheep and/or kangaroos. This was evident from high tree canopies recorded at almost every site. These potential issues could be addressed by seed enrichment under suitable host trees (such as Western myalls) and fencing around seedlings respectively. Additional studies should be conducted to determine the exact drivers behind these observations and enable appropriate management strategies to be undertaken. A special thanks to my supervisors; and to Margaret Byrne, NCSSA, BSSA, Geoff Mills, John Reid, Katherine Moseby, Paul & Colleen Manning, Sue & John Reid, DEWNR and everyone who provided the assistance and support I needed to complete my project.